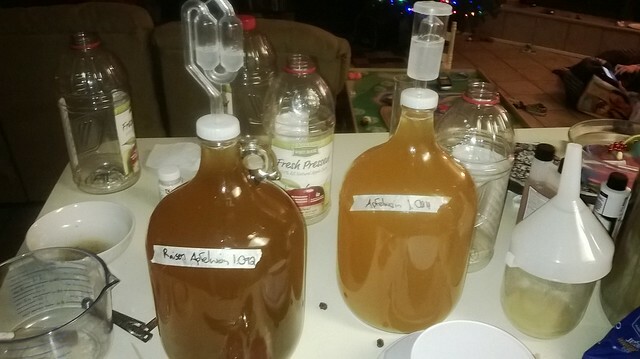 I brewed up some one gallon jugs of Apfelwein (Apple Wine) last night, using the ‘famous’ EdWort’s Apfelwein Recipie. We had a Buy One, Get One sale at our grocery store for Apple Juice, so I picked up a few jugs. The recipe is quite simple. Add half a jug of Apple juice to the carboy. Add half a pound of dextrose to the jug and shake until dissolved. 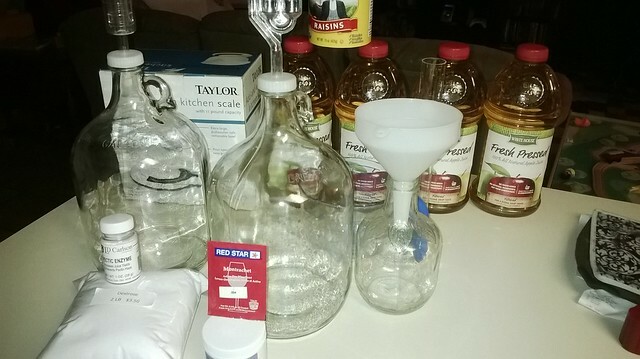 Pour into carboy, then add another jug until just below 1 gallon of juice. Add more dextrose until you hit desired original gravity. Add pectic acid and yeast nutrient, then shake until dissolved. Top off your gallon with the rest of the juice. Add half packet of yeast. That’s pretty much it. I also made some Apfelwein with raisins and brown sugar. I took about 2.5 ounces of raisins, plumped (and sanitized) them with a cup of boiling water. I added the raisins and 4 ounces of brown sugar directly to the carboy. If you look at how much juice I have in my carboys, it’s WAY to much, so I ended up spliting both batches into a third batch and topped it off with another half gallon of Apple juice. 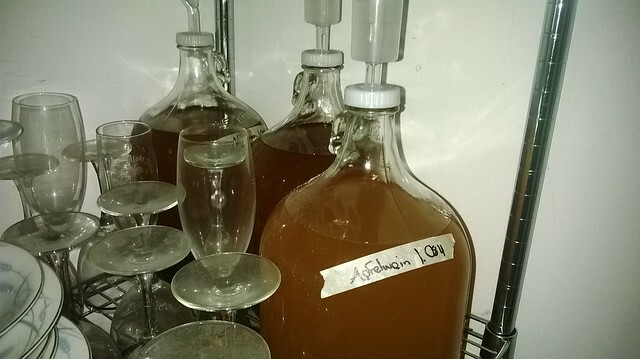 I’ll be updating this post as time goes on because I’m planning on letting them age in their carboys for 4-6 months before I bottle them.